Also, it's not clear whether the ESDC can enforce any affordable housing requirements if the funding is not available. Beyond that, former ESDC CEO Marisa Lago said in April that the project would take "decades" and a Forest City Ratner executive in July deflected the question about bond availability with a non-answer. 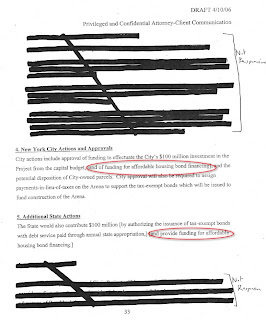 In my FOIL request, I sought "records that describe whether the board or staff, before the project approval, discussed or evaluated the likelihood that there would be sufficient tax-exempt housing bonds (from New York City or New York State) to construct the project within the anticipated 10-year project timeline." I filed it last December and finally received documents last week. An early draft of the Atlantic Yards General Project Plan (GPP), dated 4/10/06, shows (right) that the approval process included city and state approval of funding for affordable housing financing. The draft was produced by a law firm working for Forest City Ratner. It did not reflect comments from either the developer or the ESDC. Interestingly enough, a 5/5/06 revision, including comments from Forest City, maintained the provision concerning city and state actions and approvals. 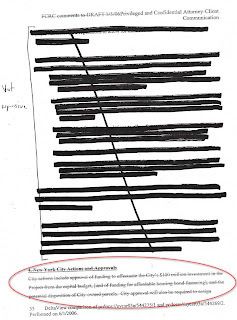 A revision (left), attached to a 6/1/06 email from ESDC Senior Council Steven Matlin, indicated that both sections, on city and state approvals, had been crossed out. Affordable housing is expected to be financed through tax-exempt bonds provided under existing and proposed City and State housing programs, such as the City's 50-30-20 program. The Project will generate at least 2,250 units of affordable housing on site for low-, moderate- and middle-income persons and families, and at least 30% of the units built on the Arena block will be affordable. The balance of the affordable housing units will be built in Phase II, however not more than 50% of the Phase II units will be completed without the completion of 50% of the Phase II affordable units. While the requirement for 30% affordable housing on the arena block did appear in the GPP, the requirement for Phase 2 was dropped. The subsequent State Funding Agreement, signed in September 2007, was silent on any requirements for Phase 2, leaving them to future "Project Documentation." There are very few references to the issue of "bond cap" or "volume cap"--whether the city and state agencies would have sufficient bonds available. Only a few months after Atlantic Yards was approved in December 2006, the New York Observer reported in March 2007 on the state's huge deficit in "volume cap," and in May 2007, Housing Preservation and Development Commissioner Shaun Donovan (now the head of HUD) testified before Congress about an "immediate crisis" facing the city. I was trying to figure out whether that issue had been considered in December 2006. The issue apparently came up not before the ESDC but before the Public Authorities Control Board (PACB), which voted on 12/20/06 to approve the project. On 12/12/06, Andrew Kennedy of the state Division of Budget forwarded several questions to the ESDC regarding AY. Two of the questions were redacted by ESDC as nonresponsive. 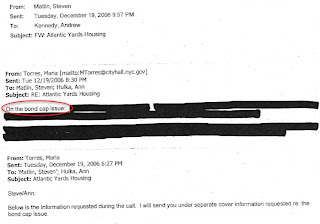 On the evening of 12/19/06, less than a day before the PACB approved the project, city official Maria Torres forwarded ESDC officials an email (left) regarding Atlantic Yards housing issues. One section regarded "the bond cap issue." As seen by the screenshot, the ESDC redacted the response. It was not marked "nonresponsive," as were several other redacted sections. So perhaps it was redacted as an "inter-agency communication" exempt from disclosure "to protect the deliberative process of government." The bottom line: they discussed it, but we don't know what they said. In July, when asked if there would be sufficient housing subsidies, Forest City Ratner official Mary Anne Gilmartin deflected the question: “There are bonds being issued for the construction of the arena, and there are programs that are being accessed for construction housing, and there are two different things. 80/20 bonds, which are the bonds used to build market-rate housing with 20 percent low-income, are volume cap bonds, which are readily available in this state, because there’s an absence of construction, nothing, frankly, is being built right now, so there is not a concern about the availability of that financing for housing." First of all, she referred to 80/20 bonds (80% market, 20% subsidized), which were used for FCR's 80 DeKalb Avenue project but are not expected to be sought for Atlantic Yards (the rental buildings of which would be 50% market). Also, she has no way to estimate the availability over the life of the project. Indeed, last year, New York City Housing Development Corporation president Marc Jahr said demand well exceeded supply. Other documents suggest continuing questions about housing issues. In May 2007, there were a few emails between ESDC officials and Priscilla Almodovar, who heads the state Housing Finance Agency. It is the expectation of the parties that Developer or its Affiliates will apply for financing and other incentive programs then generally available to developers of Affordable Housing (as defined herein) and that, if such application is deemed by the applicable administering agency after good faith review to be consistent with then-applicable program rules and standards, then Developer or its Affiliates will receive incentives under such programs consistent with what developers of such Affordable Housing are receiving at that time. Unclear is why the parties had that expectation without checking to see whether the housing bond programs were available. 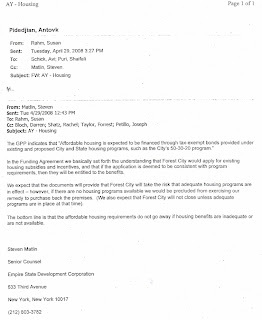 Subsequently, in April 2008, emails indicate discussion between the ESDC and the governor's office regarding affordable housing. I tried, without response, to get some clarification on the somewhat confusing 4/29/08 email (right) from the ESDC's Matlin. In the Funding Agreement, we basically set forth the understanding that Forest City would apply for existing housing subsidies and incentives, and that if the application is deemed to be consistent with program requirements, then they will be entitled to the benefits. The bottom line is that the affordable housing requirements do not go away if housing benefits are inadequate or are not available. It's not clear what Matlin means by "documents," but I suspect the reference is to yet-unsigned documents regarding the Master Closing. Still, if housing benefits are inadequate or not available, there's no way to fulfill the ten-year timetable. If Developer or its Affiliates fails to complete the balance of Phase 2 by the Final Deadline, subject to Force Majeure and subject to Governmental Authorities making available to the Project affordable housing subsidies then customarily available to developers of such housing, ESDC shall have an option to purchase Developer's or its Affiliates' interest in the parcels not yet developed pursuant to the GPP, as it may be amended. Such option to purchase shall be pursuant to terms negotiated in the Project Documentation and shall provide for a purchase price equal to the Developer's or its Affiliates' cost and land carrying cost, adjusted for inflation. That suggests that if affordable housing subsidies are not available, ESDC will not have an option to purchase and will not be able to enforce the timetable, despite Matlin's email. However, I've been unable to get a response from the ESDC. Also, the meaning of this statement is unclear: We also expect that Forest City will not close unless adequate programs are in place at that time. It's unlikely that this means "close on the project as a whole." After all, the developer's priority is to build the arena. It may mean "close on each parcel"--but I haven't had that confirmed. Also, if "the affordable housing requirements do not go away if housing benefits are inadequate or are not available," how then are they enforced? As noted, the State Funding Agreement suggests that the developer has an out. A day after Matlin's email, he informed Susan Rahm, the consultant volunteering for--and, perhaps running--the Atlantic Yards project for the ESDC, that the law firm Bryan Cave had two partners with affordable housing expertise. A week after that, she asked if they should be speaking to Almodovar of the state housing finance agency. In other words, the affordable housing issue remained in flux--and may well remain in flux.